Everything tastes better in miniature form! 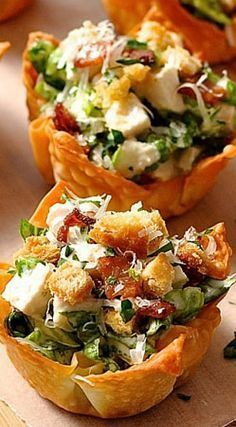 These Caesar Salad Wonton Cups are made using wonton wrappers as the cups. They bake crispy and golden with just a light spray of oil. A great shortcut for appetizers! Everything tastes better in miniature form! Preheat oven to 180C/350F. Fit the wonton wrappers into each hole of a standard size muffin / cupcake tin (not mini and not Texas muffin tins!). Spray the wontons lightly with olive oil. Bake for 8 to 12 minutes, until golden and crispy. Remove from oven and set aside to cool. Heat a small non stick pan over high heat. Spray with oil, add bacon and sauté until crispy, then remove and drain on absorbent paper towel. Return pan to stove, reduce heat to medium high and spray pan with oil. Add finely diced bread. Shake pan (or stir) to brown evenly. Remove mini croutons from pan, scatter over a pinch of salt and set aside. Place Dressing ingredients in a blender or food processor and whizz until smooth. If it seems too thick, use a tiny splash of milk to adjust the consistency. Place cos lettuce, chicken and bacon in a bowl with 6 to 8 tbsp of dressing (depending on how much dressing you want to use) and toss gently to combine. 1. This makes 1 1/4 cups of dressing. I found it difficult to make a smaller quantity in my food processor. Keep leftover dressing in the fridge - it will keep for a week. However, my mum made a sensible suggestion - if you use a mortar and pestle to grind the anchovy and garlic to a paste (and assuming you are using finely grated parmesan) then you don't need a blender which means you can make a smaller quantity of dressing (half the dressing is plenty for 12 wonton cups). 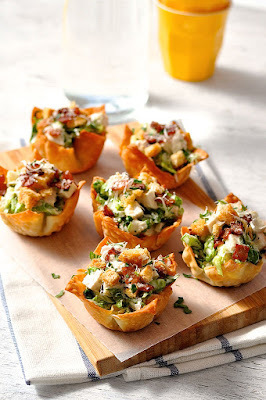 0 Response to "CAESAR SALAD WONTON CUPS"